There’s no question about it: it’s tempting to let screen time be your preschool child’s babysitter. Whether it’s time on TV, YouTube, a tablet, or your phone, screen time is a mesmerising and all-absorbing thing for children, and it can be a method to allow you to get some much-needed rest, peace, and quiet. However, since too much screen time can hurt your child’s brain development, you need some alternatives of things that you can do with your child to engage their attention, teach them about the world, and build memories of time you’ve spent together. Here are a few ideas from our preschool daycare in Upper Darby. Preschoolers are not at the age where they can follow a recipe, but they absolutely love to dump the ingredients in the bowl and stir them up. Talk to them while you’re letting them help bake, explaining what you’re about to do at every step before it happens. 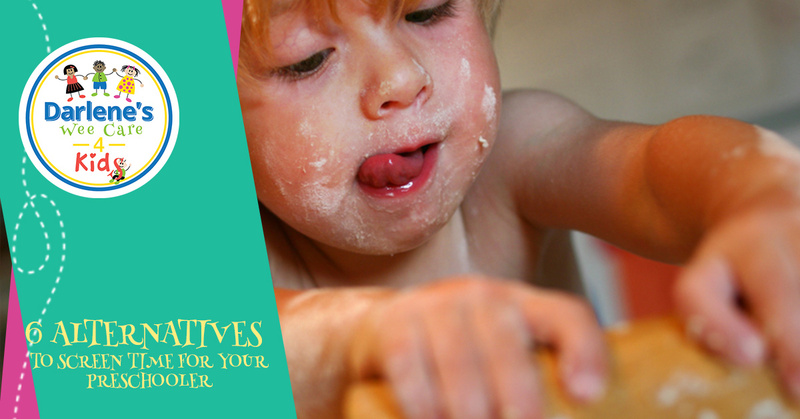 Give them a heads up of things they won’t know, like “stir gently so that the dough doesn’t come out of the bowl” or “flour will make a mess if it spills, so dump this carefully.” Your child will most likely love the interaction and attention and aim to please. If you do get a few spills, have a moist paper towel handy and don’t make a big deal of the accident. Whether you can go to your own backyard or a neighborhood park, taking your child outside is crucial for their development. You will be giving your child fresh air and sunshine as well as a whole host of opportunities to build their motor skills, increase their understanding of cause and effect, and improve their imaginations through exploration. Doing simple puzzles together helps your preschooler to develop their problem skills, and playing board games helps to develop social skills like turn-taking, how to handle winning and losing, and patience. Age appropriate activities like these are fun for your child, and they’ll probably ask to repeat them again and again. Coloring is a simple activity, but it’s amazing how long a child can remain absorbed in it, especially after you’ve invested a little bit of time in teaching them to color. Provide a little bit of guidance and praise them for the beautiful picture they’ve colored, and you’ll find that coloring can become a staple activity in your repertoire. Reading aloud will boost your child’s vocabulary and language comprehension, and it will also teach them vital skills they’ll need in school, such as page turning and holding their attention through the whole story. Try to make it a practice to read aloud to your toddler or preschooler on a daily basis. This may be one of the very simplest ways to give your child something to do without derailing yourself from your tasks. Whether you’re folding laundry, dusting, picking up clutter, or doing yard work, give your child an age-appropriate opportunity to help, whether it’s holding two socks or following you with their own personal dust cloth. For all the times that you can’t be there to give your child hands-on care and attention, enroll them in the daycare center in Upper Darby that cares about their well-being. Contact us today to get started.